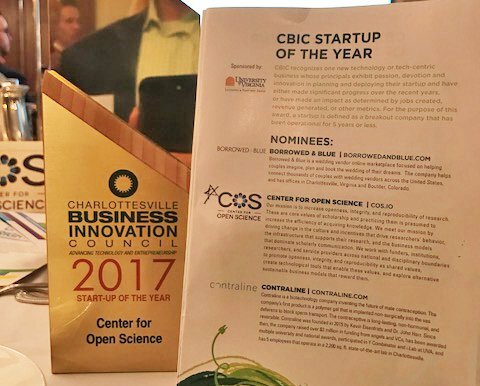 Last night, the Center for Open Science received the “Startup of the Year” award at the CBIC awards gala, an annual showcase of technology innovation in our home town of Charlottesville, VA. This was COS’s third nomination for the award and final year of eligibility in the startup category. We are very grateful to our Charlottesville community for supporting and recognizing our efforts, and very proud of the progress that we have made. 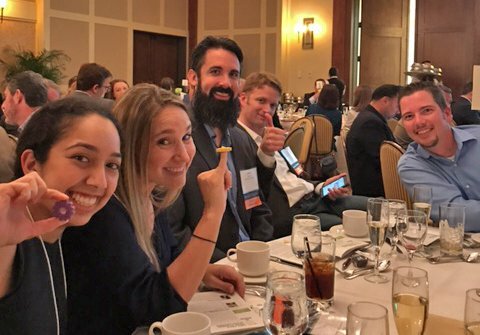 It is unusual for a organization like ours to win awards as a technology startup. But COS is an unusual organization. We are a non-profit -- we are mission-driven, we do not monetize our products, and we are aiming to reshape the research culture. We build exclusively free and open public goods for the research community. Simultaneously, to meet our mission, we operate like a commercial technology company. Our team is a highly talented, committed group of developers, designers, researchers, change agents, and operations specialists. We have an efficient, commercial-grade product development process and operate at the pace of the competitive marketplace. We maintain a modern, enterprise-level technology stack that is starting to scale. We operate in this hybrid fashion because a non-profit monetization model (none) and a commercial operational model (fast, efficient, scalable) are both essential for our mission. We exist to disrupt the status quo of scholarly communication with public goods infrastructure. We are fostering a new, open technological ecosystem that connects the entire research lifecycle, and will put the power of innovation into the hands of the scholarly community itself. OSF Preprints, and the many community-run services it supports, is just one interface illustrating what is coming for many other verticals of scholarly communication such as repositories, registries, and journals. So how can we operate with the ideals of a non-profit and the innovation, efficiency, and effectiveness of a commercial enterprise? We are fortunate to have generous funders and donors who share our vision for transforming the scholarly communication landscape. Our supporters recognize that disrupting a multi-billion dollar industry requires investment. The generosity to date has established the foundational technology upon which we have begun to scale. And, we need your help to support this transition to scale. If we continue to execute our strategic plan, your investment in COS will improve the efficiency and effectiveness of all areas of research. Opening the research lifecycle and fostering a marketplace for community-led innovation will provide an orders of magnitude return on investment for the social good. On the occasion of this award, we thank the financial supporters that have made it possible to get this far. And, anticipatory thanks to future supporters that will help us scale the products and services to meet the needs of the research community.